The history of Faculty of Computing (FC) began in 1981 when it was known as Department of Computer Science, under the wings of Faculty of Science. This department began its operation at UTM Gurney Road Kuala Lumpur where it received its first intake of Computer Science Integration Programme students. This programme integrated the programme of Diploma with Bachelor of Science (BSc) of Computer Science. In 1984, the department was established as Institute of Computer Science that consisted of Academic Unit and Administrative Computing Unit. In 1991, the Institute was separated from the Administrative Computing Unit and be elevated to a faculty status knows as Faculty of Computer Science and Information Systems. The year also marked the first intake of Master of Science (MSc) and Doctor of Philosophy (PhD) of Computer Science students. The establishment of new faculty, increasing student and staff populations, and demands for facilities have resulted in a move to the UTM main campus in Skudai, Johor in 1995. As the years go by, the faculty has seen a significant increasing number of students due to the popularity of its high quality postgraduate academic programmes. The number of postgraduate students and staff, and demands for more sophisticated facilities has resulted in additional 5-storey building in 2012 to provide a conducive environment for teaching, learning and research. 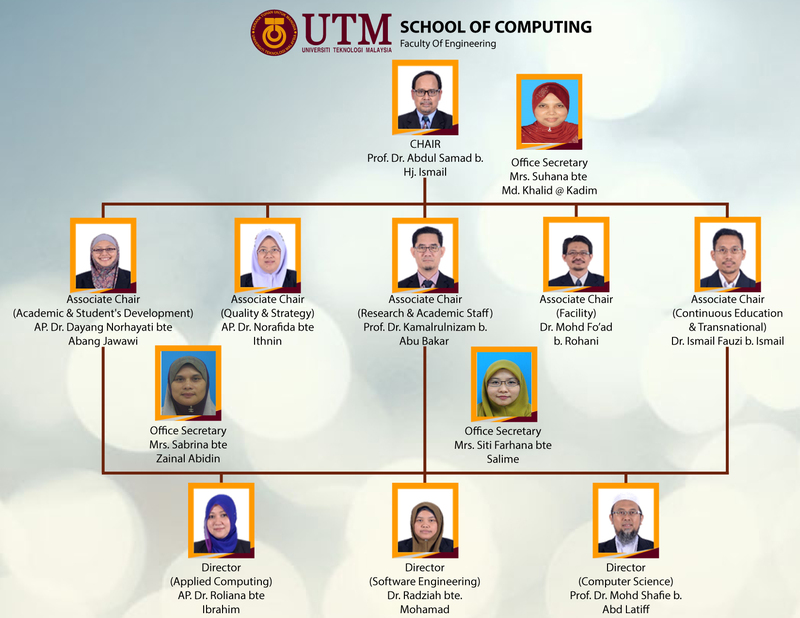 In January 2013, once again the faculty made a significant stride by rebranding the faculty’s name from Faculty of Computer and Information System to Faculty of Computing. Branding the organisational restructuring and strengthening the academic programmes as well the faculty researches will hopefully make it in line with the university vision to be recognized as a world class centre of academia and technological excellence. All praise is due to Allah, an d Allah’s Peace and Blessings be upon His Final Messenger, his pure family, his noble Companion, and all those who follow them with righteousness until the Day of Judgement. Assalamu’alaikum and welcome to School of Computing, the pioneer in Computer Science at this country that offers both undergraduate and postgraduate programs in education for more than 30 years. The School aspires to be a center of excellence in computer science education at all level. We have been actively developing and revising our undergraduate and postgraduate curriculum to fulfill the requirements of international and national standards and our stakeholders. We strongly believe that the school’s vision to be a highly reputable computer science institution could only be achieved through our active engagement in research. Recently, we have organized ourselves into a number of research groups, which in turn supports a university-wide grouping, known as research alliances. Our strategy is two-folds: developing strengths in a number of existing research areas and by exploiting Computer Science’s unique opportunities for collaboration with other research groups at the University. The school received a number of grants to boost our research activities which translates into an increment in the number of research assistants and postgraduate students. The quality of research is manifested by the list of high impact and citation-index journals, patents and copyrights. Lastly, I am hoping that with the accomplishments outlined will serves as an encouragement as to why we can march into the future together with much reassurance, confident that we in this school will persist in our quest for greater excellence. To be a leader in the development of high quality human capital, innovation and services in ICT that will contribute to the nation’s wealth creation.